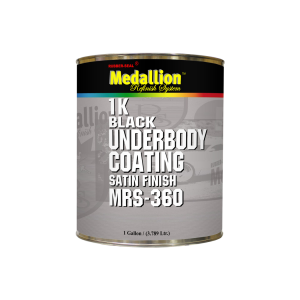 MRS-360 1K Underbody Coating is an enamel based high build coating designed for coating under carriages. This coating is ready-to-spray, requires no hardener and is compliant in all 50 states. MRS-360 is used for coating frame rails, brackets and under carriages. It dries in 30 minutes (1 coat) and can be reduced with "Zero" V.O.C. reducer up to 25%. Available in gallons, fives, and 55-gallon drums.